LEGO Technic Mini Off-Roader features independent 4-wheel suspension, big knobby tires and opening doors…. Tackle the roughest surfaces with the tough LEGO Technic Mini Offroader! This 2-in-1 model features cool and realistic details, like extreme, independent 4-wheel suspension, big knobby tires and opening doors. You can even remove the top section and easily rebuild this great model into a rugged mini buggy and blast over the sand dunes! This toy costs approximately £7.99 (for the latest and best prices make sure you check our retailer list for the LEGO Technic Mini Off-Roader 42001 above). 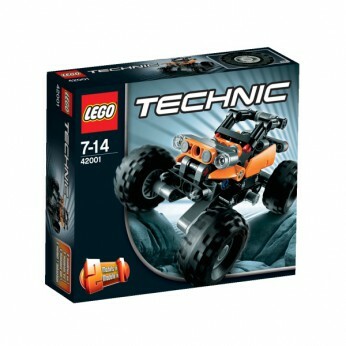 In our review of LEGO Technic Mini Off-Roader 42001 we classed it as being suitable for ages 6 years, 7 years, 8 years, 9 years, over 10 years but recommend you check the manufacturer specific advice before purchasing.